A homeowner has been charged in the murder of a young, unarmed teen shot and killed in the middle of the night in suburban Dearborn Heights. NBC's Kevin Tibbles reports. The parents of an unarmed woman who was shot to death on a suburban Detroit porch spoke publicly for the first time Friday since the teen's death 13 days ago, thanking the county prosecutor for filing charges against a homeowner in the case. 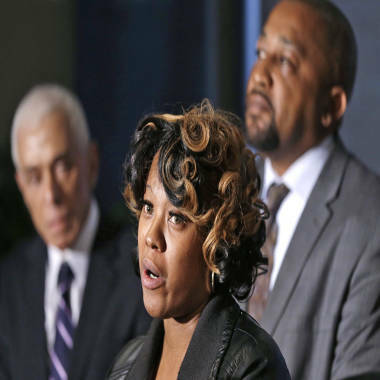 Monica McBride, center, and Walter Ray Simmons, right, the parents of Renisha McBride, address the media with attorney Gerald Thurswell in Southfield, Mich., on Friday. "I hope he spends the rest of his life in jail," Walter Simmons, father of 19-year-old Renisha McBride, said, referring to the man charged as the "monster that killed my daughter." McBride was killed on Nov. 2 in Dearborn Heights, Mich., when she went to 54-year-old Theodore Paul Wafer's porch seeking help after a car crash, according to authorities. Wafer was arraigned on three charges — the most serious of which was murder in the second degree — on Friday afternoon, hours after the Wayne County prosecutor said in a press conference that he "did not act in lawful self-defense" and that he would be turning himself in to face justice. Simmons and his wife, Monica McBride, thanked the prosecutor and their community, which has rallied around the family, with supporters demonstrating outside the Dearborn Heights police station to demand charges. The case has also prompted protests from civil rights leaders, who believe racial profiling may have played a role in the killing of the unarmed McBride, who was black. 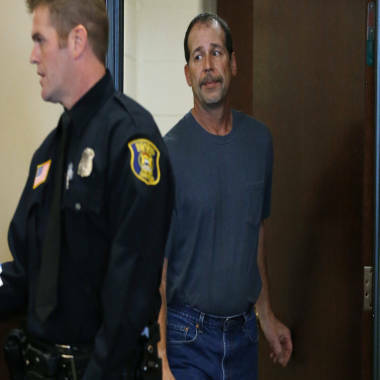 Theodore P. Wafer, 54, of Dearborn Heights, appears at his arraignment in Dearborn Heights, Mich., on Friday, Nov. 15. McBride's parents described her as a family-oriented young woman with dreams of being a nurse or doing something in the automotive field who loved animals, playing soccer and being with her sisters. "That is going to be the biggest tragedy, that they don't get the opportunity to see her again," Simmons said of McBride's older and younger sisters. Police say McBride crashed a car in nearby Detroit and knocked on the homeowner's door afterwards, looking for assistance. McBride was "bloodied, disoriented and appeared to be confused" after the crash, according to witnesses, Worthy said. Wafer told police he thought McBride was breaking in; he also said his shotgun went off by accident. Few details about what happened the early morning of McBride's death had been released before Friday. The Wayne County medical examiner's office ruled her death was a homicide, finding she received a fatal shotgun blast to the face, fired from a distance. "There is no evidence of forced entry into the home," Prosecutor Kym Worthy told reporters Friday after announcing the charges, which also included manslaughter and firearms possession during the attempted commission of a felony or commission of a felony. "Our evidence shows she knocked on the locked screen door." Renisha McBride's parents join Tamron Hall to discuss the arraignment of the suspect who allegedly shot and killed their daughter. Monica McBride told reporters she wanted to know why someone would shoot her daughter. "I can't imagine in my wildest dreams what that man feared in her to shoot her in the face," she said. Wafer, wearing a T-shirt and jeans, said little at his court appearance. Bond was set at $250,000. The prosecutor would not comment on allegations that race played factor. "The charging decision has nothing to do whatsoever with the race of the parties. Whether it becomes relevant later on, I don't know," Worthy said. Michigan's self-defense law states that residents have no duty to retreat while in their own homes if they have an honest and reasonable belief of imminent death or great bodily harm. Worthy said Friday that prosecutors had chosen "appropriate charges" for Wafer. On Thursday, a toxicology report from the medical examiner's office revealed McBride had a high blood alcohol content and marijuana in her system when she died. Wayne County, Michigan prosecutors announced homicide charges against a man accused of shooting a woman in the face after she knocked on his door looking for help. McBride's blood alcohol content was .218 percent, nearly three times the legal driving limit of 0.08 percent in the state of Michigan. Her crash involved a parked vehicle six blocks away, authorities told The Detroit Free Press. Gerald Thurswell, the McBride family's attorney, said the homeowner called 911 after he shot McBride, and said that police arrived within minutes. "If he had called 911 when he heard her outside his house, they would have been there within two minutes and she would be alive today," Thurswell said. "Maybe she would have been arrested for being intoxicated, but she would not be dead." Thurswell said on MSNBC on Friday he doesn't believe that the results of the toxicology report will affect the case. "If she was intoxicated, and apparently she was .... that gives nobody justification to blow off her head," he said. "She was outside making noise. We don't shoot drunks who are making noise."